Tea Tree-Infused Pure Eucalyptus Oil Showermist – The Lutzka Blend. You may know a thing or two about tea tree oil. Also known as melaleuca, the oil comes from the leaves of a small tree native to Australia, and it’s been used for centuries by the indigenous people of Australia as traditional medicine. They taught us how to inhale it for coughs and colds, and how to apply it directly to skin for a wide variety of germ-killing and healing uses. Nowadays, tea tree oil is considered to be a “medicine cabinet in a bottle” since the chemicals contained within it have been shown to have antibiotic, antifungal, antiseptic, expectorant and antiviral properties. From hand sanitizer to acne treatments to a household cleaner, tea tree oil is one of those oils that can have a huge positive impact on your daily life when used properly. We combined it with our Pure Eucalyptus Oil to pack a one-two holistic punch. Both of these powerhouse oils have similar germ-fighting properties and when used together in your shower, mold & mildew stains disappear with a spray that smells clean, fresh and crisp. We have to admit though that the creation of this blend came about a little differently than our other infusions. EuroSpa Aromatics is always developing new infusions, but in this case, tea tree came to us via pro skateboarder, Greg Lutzka. Now, we realize that you may not know a thing or two about Greg, or why we’d be partnering with a skate pro for a Eucalyptus Oil infusion. Greg sat down with us to help explain how this all came about. EA: How did you come to know and love EuroSpa Aromatics ShowerMist? GL: I was going to the sauna at the gym, and people used eucalyptus sprays in the gym and basically I really liked the smell of eucalyptus. So I went on Amazon and typed in “eucalyptus sprays” and EuroSpa came up as number one with five-star reviews. So I reached out to them and that’s how I got connected to them. EA: So you’re an essential oil fan — how and why did you start using oils? GL: I kind of started using them because of going to the gym where people had them and used them. For Christmas, my mom got me a diffuser for my house and I just like the smell of it in my house. I really like the smell of the essential oils and the effects that they give, and the way your body reacts to them. And eucalyptus is a natural disinfectant, which I think is pretty cool too. EA: How do essential oils fit into your lifestyle? GL: I mainly use it in the shower in the morning. It wakes you up and gets you going. Now with EuroSpa’s lavender blend, I’ll spray that in my room at night that does work to help me sleep. When I go to the sauna and steam room at the gym, I use the Pure [Eucalyptus Oil] and now the Tea Tree infusion. It kind of smells weird in there so every time I go in there I spray the ShowerMist. It doesn’t take much, just two or three sprays and it just cleans it up in there. And you can just see that people are really happy when I come in there with the spray. I also have Eucalyptus candles because I’m just a big fan of Eucalyptus and I really like the smell. EA: There are a few different Eucalyptus Oil brands out there on the market and in spas and fitness centers, so why is EuroSpa your favorite? GL: I went to Mother’s Market [for the oils] and originally I made my own mix and the sprayer got all clogged up. They were too thick and didn’t work too well with that sprayer. So I went to Amazon and looked up Eucalyptus Oil spray. I found EuroSpa and they had five stars. Then I went to Instagram and saw they were promoting pretty much every day and very active on social, which I thought was pretty cool. And then the product is awesome. I don’t know how they do it exactly, but it’s not super thick so it sprays really nice. Then when I met them, they were really nice people and it was just really cool to sit down and talk with them about the eucalyptus sprays. EA: How did creating this blend come about? GL: The signature blend came about because they didn’t have a Tea Tree version yet. I really like Tea Tree. And I really like the smell of Eucalyptus. We thought that this signature blend would be a great way for me to promote my experience and the difference it’s made in my life. EA: In creating this blend with EuroSpa, what do you hope your fans and followers will learn or take away from it? What’s your message when it comes to using Eucalyptus and Tea Tree Oils in everyday life? GL: For me, what I’m getting from it, is that the sauna helped change my life to the point where I got one in my house now. The essential oils help in the sauna to clean it out and after the sauna, I feel the difference in my body, on my skin, the way I sleep. My mind feels clear, I let go of everything from the day, all the stress, and it just regenerates you. The sprays also help wake me up in the morning and help me sleep better at night. What I want to give others is the experience that I get from using the sauna and the sprays, and seeing what I do and how they help me. I think that’s the most important thing for me. My friend and roommate recommended the sauna to me and said it would change my life. If he never told me about it, I would have never gone and experienced it. I saw too that this made a huge difference for guys that I look up to. And if it made a huge difference for them and is a great experience for me, I think that it’s worth promoting and everyone should know about it. 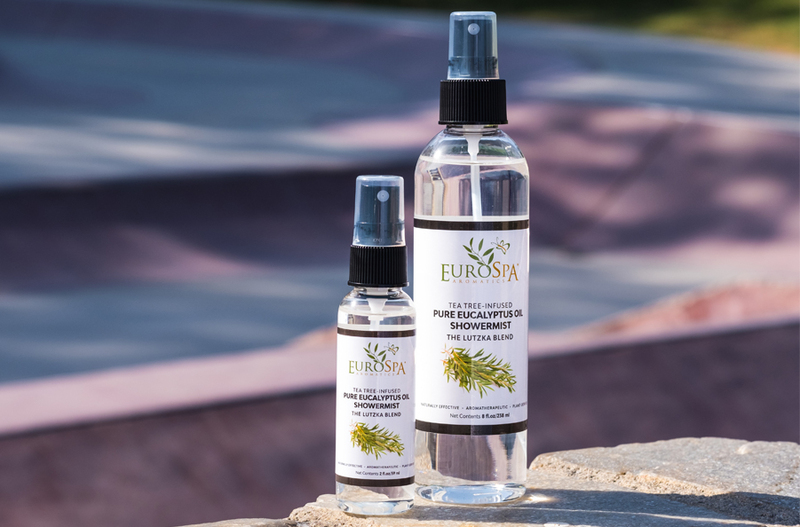 Our Tea Tree-Infused Pure Eucalyptus Oil ShowerMist – The Lutzka Blend is now available in our store and on Amazon, in both 8oz and gym bag-size 2oz spray bottles.